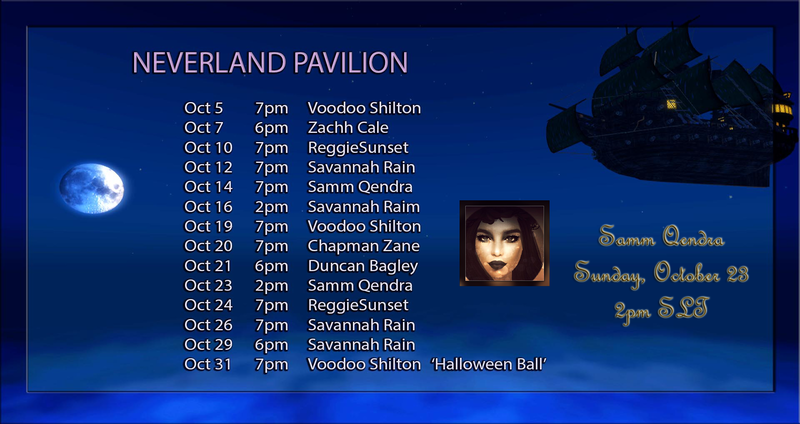 Samm Qendra at Neverland Pavilion, 2pm SLT, Sunday, October 23! Have some pixie dust for transport to Sunday’s 2pm concert at Neverland Pavilion featuring Samm Qendra – costume up and join us for her magical voice in this fantastic magical place! Meanwhile take some time to explore Neverland:) It closes October 31 – only 8 more days! This entry was posted in Uncategorized and tagged Best in Second Life, Best of Second Life, Calas Galadhon Park, HALLOWEEN, Live Music in Second Life, Samm Qendra, Second Life, Virtual world by Romie Vella. Bookmark the permalink.